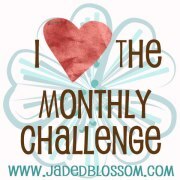 Jaded Blossom: Anything with a Summer Twist Blog Hop WINNER!!! Good Morning Everyone, First we just wanted to say Thank You so Much Hopping with us. We just have a few Announcements! Tomorrow we have a new Challenge. Also, Don't Forget Next Week is Release Week! Cant wait for the new release and Congratulations to the winner!! Congrats Kathy!! Can't wait to see the New Release!! Thanks so much, so excited I won! !